LOS ANGELES -- Velvet Revolver guitarist Slash and his wife left court on a happy note Friday when a judge ruled they can move forward with their lawsuit claiming they lost more than $500,000 in a transaction involving a Hollywood Hills home. Los Angeles Superior Court Judge Mel Red Recana ruled there were triable issues of fact in the lawsuit that should go before a jury concerning their allegations they were duped into buying the property. He rejected defense claims that the case should be thrown out before trial as well as their claims for punitive damages. "It's a great day," Perla Hudson said to her musician spouse as she left the courtroom. She and her husband -- whose real name is Saul Hudson -- declined any comment on the ruling. However, one of their lawyers, Todd E. Whitman, said he was happy with the ruling. "We're pleased he denied the motion for summary judgment," Whitman said. "It's unfortunate what happened to my clients." Whitman said real estate agent Gregory Holcomb never told the Hudsons the seller said they could have backed out of the purchase if they wanted to. The couple has not bought another home since, Whitman said. Holcomb and Sotheby's International Realty, named as defendants in the case, maintain there was no way of knowing that the Multiple Listing Service description of the home was incorrect and that it was not actually on a private street. Defense attorney Fredric W. Trester -- who argued the title to the property was clean when the Hudsons bought it -- said he had no immediate comment on the ruling. The trial of the suit is scheduled Sept. 21. 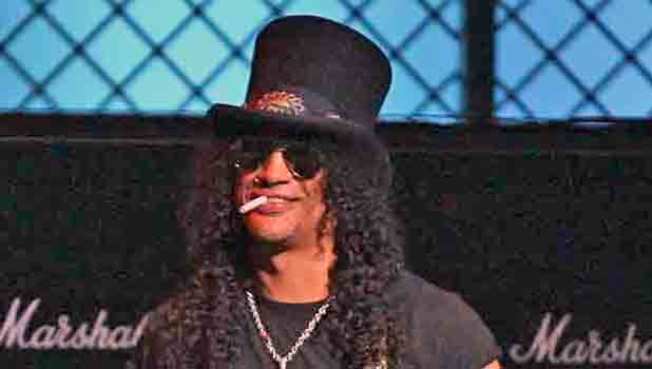 The 43-year-old Slash became famous as the lead guitarist for Guns N' Roses. In a sworn declaration, filed with the court previously, Perla Hudson claimed she and her husband closed escrow on the home in January 2006 for $6.25 million, then sold it in November 2007 for $5.725 million without ever moving in. The couple lost an additional significant amount of money in carrying costs on the property, while Holcomb received a commission of nearly $124,000, the Hudsons' court papers state. "I thought I had found a dream home when Holcomb sent me information about a house with spectacular views on what was purported to be a private street," her declaration says. Although the street is gated, it is public and has very little parking, according to her statement. The rocker and his wife also say the home was much smaller than 7,800 square feet, as listed, and that there were other issues with the title to the property. In choosing a home, Perla Hudson says she and her husband also were concerned about security for themselves and their two young sons. "In the summer of 2005 we were forced to obtain a restraining order against a deranged fan," her declaration states.